Yes, we are all sickened by SeaWorld, and other water parks...while it's fresh in our minds. But now what are we all going to do about it?? How do we stop it from continuing? It is a shame what the love for money and profit will cause some people to do. My heart goes out to all the affected families. 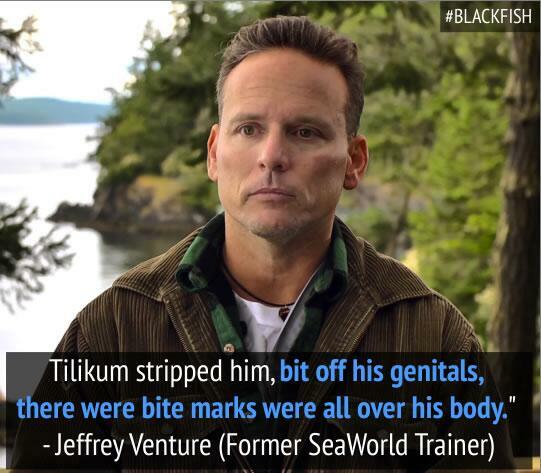 Tilikum wants out and has being trying to get that message across for decades now. How many more casualties do we need before he is released? Maybe if Kelly Clark is next in line, that will do it. Tikilum and his offsprings all over the world need out. Release them. I'm saddened to see these beautiful animals being treated so horribly. I could never take a step in SW knowing what I know now. I'm so happy CNN is sharing this. Hopefully this is the beginning of change. The end of the film where they show the credits and the whales are swimming FREE is so beautiful...so natural...so what it should be for them...together...swimming together....FREE!!!!!!! I watched this film twice and see absolutely no justification for removing killer whales from their habitat, the world's oceans, to perform tricks for human amusement. They belong to the world's oceans not Sea World. The movie was brilliant and sensitive. How can new trainers not be briefed on dozens of past incidents? Im disgusted I wish I would of watched this before we went on vacation last month to SD Seaworld. Knowing what I know now I will never go back . Nor will I take my children again I will educate my kids to respect and view nature in its natural habitat. I feel sick!! Props to everyone involved in making this fantastic film. Thank you. My sister in Florida volunteers at the Marine Science Center in Ponce Inlet, Florida. When I told her to watch this film tonight and told her what it was about, she replied that Sea World does a lot of good, i.e, when there's injured manatees that the science center can't do more for, they come and take them. I think that Sea World should just be a rehabilitative center and the whales should be released. Otherwise, it is a despicable organization and this group is no better than the Japanese with what happens in The Cove. I will never go to Sea World. ARE YOU KIDING SEAWORLD? WOW . MY HEART GOES OUT TO ALL THE WHALE IN CAPTIVITY. I can't believe that SW exec had the nerve to not only blame her death on her, but to say he knew if she was there she would say the same thing. Outrageous.